Swancorp offers a diverse range of sulphur products for the agricultural, stockfeed and mining industries in Australia. Primarily, Swancorp’s sulphur range is used in stockfeed and fertiliser applications in addition to their use in large volumes as a drossing agent in the mining sector. Swancorp has worked very closely with its sulphur source and stockfeed manufacturers in the Australian industry to develop a number of stockfeed grade sulphur products. 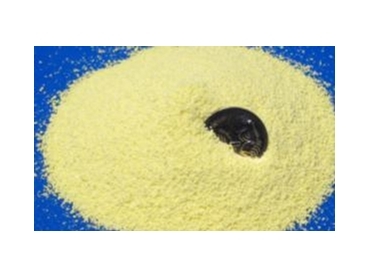 The sulphur process allows Swancorp to market a number of stockfeed sulphur products with precise particle sizes suitable for inclusion in the diets of pigs, beef cattle, dairy cattle, poultry and horses. Swancorp supplies Australia’s largest stockfeed manufacturers with their stockfeed sulphur products. Correct diet ratios can be determined in consultation with an animal nutritionist. The sulphur refining process and particle size output allow Swancorp’s stockfeed sulphur range to be marketed as non-dangerous cargo for transportation, which contributes towards substantial freight savings for the Australian agricultural community. The sulphur range is available in 25kg bags, 1.2t bulk bags and in bulk quantities.